Preheat oven to 350 degree Fahrenheit. Pour hot coffee over chocolate, and let this sit for a minute. Stir until the chocolate is fully melted, then add in the sugar, flour, and oil. Mix until fully combined, then mix in eggs, one at a time. Add vanilla, baking powder, salt, and vinegar, and mix until incorporated. I mixed by hand, but you can also mix with a hand mixer. Pour batter into lined cupcake pans, filling each liner 2/3 full. Bake for 12-15 minutes, until the cupcakes are just baked through, and a toothpick inserted in the center comes out clean. Remove the cupcakes from pans, and let them cool on a wire rack. Once the cupcakes are fully cooled, pipe on frosting using a large, round tip. 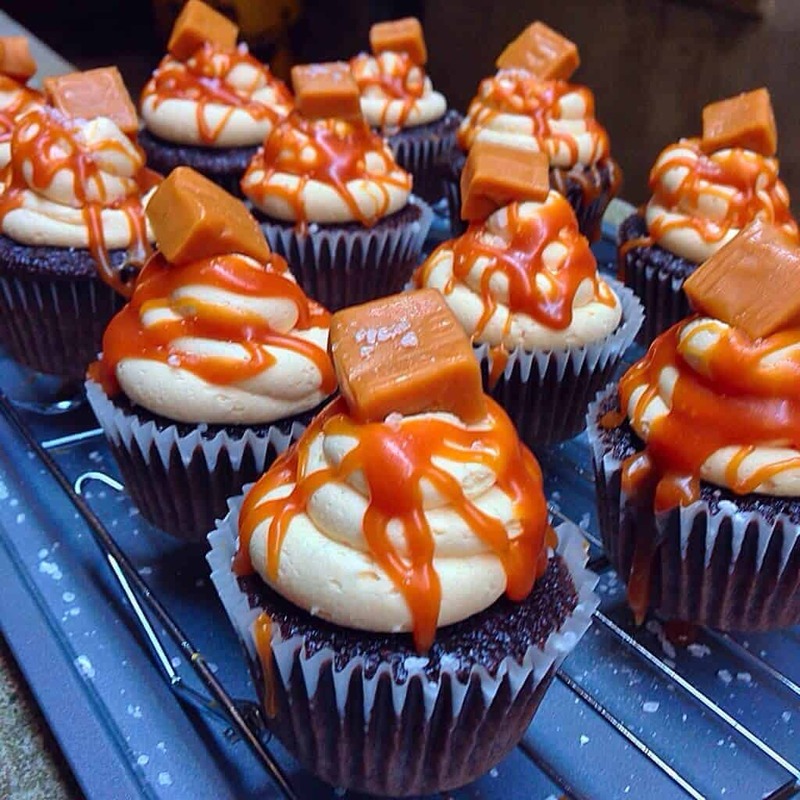 I topped each cupcake with a drizzle of caramel sauce, a caramel candy I bought at the grocery store, and a sprinkle of sea salt. I have been looking for a good caramel buttercream thank you!!! You have the oil listed twice in the recipe. When should you actually add the oil? just updated the post, so sorry about that! I add it after the flour and sugar. Hope that helps, happy baking! Thank you, these cupcakes are fantastic by the way! I love following you on Instagram! You inspire a lot of my creations!! aw thanks!! I’m so happy to hear that ? ?